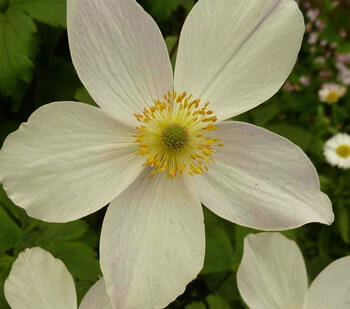 Windflower. This plant flowers intermittently from May to November. Each pure white petal has a distinct grey-blue streak along the reverse, so when in bud, or when the flowers nod and half close (in the mornings and evenings) the flowers look bluish, but when they are fully open they are a dazzling pure white. 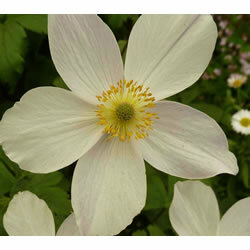 Ideal for the woodland garden or partially shaded bed. H. 45cm S. 45cm. Deciduous. Hardy. Water well before planting.